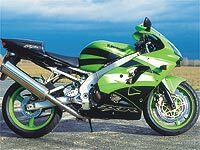 Kawasakis 2002 ZX-9R seems faster than ever, showing 300kmh at 12,000rpm.While we all know speedos can be inaccurate, the bike feels significantly quicker than a 900 should! But top speed isnt the only change. The new ZX-9Rs chassis, swingarm and extra kick in the mid-range all help to create a more flexible Kawasaki. 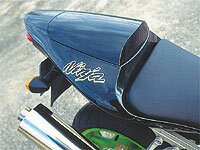 The chassis is beefed-up for extra-strength, especially around the headstock. Sadly the new racier-looking swingarm is still finished off with those unloved R-pins through the rear wheels spindle. The front and rear suspension settings are stiffer, theres a new subframe, Nissin four-piston calipers in place of the old models Tokico six-pots and a new exhaust system, plus new clocks. It has magnesium cylinder head and engine covers. The new third and fourth gears make for smoother operation and theres a heavier crankshaft, new cams, valves and ignition system. It now feels much easier to ride hard without feeling like the bikes going to wrap itself up in knots and get you in to trouble. 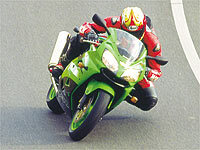 Its much more direct, the bike takes on going fast on the road smoothly and fast. The front-end has been tweaked for better aerodynamics and the rear-end loses the bulbous look. The riding position is much like the old bike, so its sporty without cramping. It may be heavier but weaving around the tram-lines of Cologne shows up just how agile the bike is. Maybe its the wide bars or the way you sit on top of the bike, but its one of the easiest sports bikes around to hustle on the courier run. CBR600 excluded. Get to 5000rpm and the mid-range comes in but theres no significant kick, its smooth the way it feeds in so youre not about to end up in the back of a Smart car. But town isnt where this bike really shines, so we head out in search of some good riding roads towards Dusseldorf. Give the ZX-9R some room and it shows why it is one of the best sports bikes on the road and though it might be aimed more at the Blade than the GSX-R and R1, its a brilliant sports bike. What surprises is how quickly the bike revs, snarls and grunts its way to the point where enough is enough. This is one very quick bike. Come out of a bend at 5000rpm and theres no drama. Rev it out and try and upset it coming out of a turn and the bikes more stable than ever. If you gave the old ZX-9R a real handful while cranked over coming out of a bend it would rear straight up on to its back wheel and get all lively. This one comes out hard in a controlled way letting you feel how much grip is left on the Michelin Pilot Sport tyres. The revised stiffer rear suspension and stiffer swingarm keeps everything in place. For hard riding its still not as good as a new Blade or GSX-R but it has certainly closed the gap.